Curious how Paccione gets that perfectly thin New York-style crust? Wonder no more. In episode no. 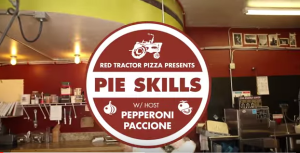 3 of Pie Skills, Adam (playing Pepperoni Paccione) shows fans how to shape pizza dough prior to tossing it. Click on the image below to watch the full video, or read this quick step-by-step guide for getting the job done. 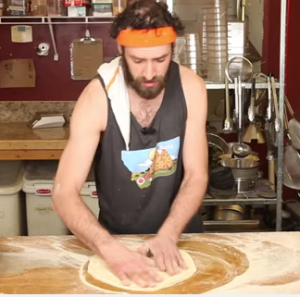 Step 1) Start by patting down the dough in a symmetrical fashion and placing it down flatly on the countertop. Step 2) Next, make sure that the dough is completely covered with flour. Step 3) Use your non-dominant hand as a guide by gently holding the outside edge of the dough in place. Step 4) With your dominant hand, you’re going to use the two-finger method to form the crust. To do this, simply take your two pointer fingers and push them into the edge of the dough, towards your guide hand. Then, rotate the dough a bit with your dominant hand and do the same thing again. Continue rotating and pushing down into the dough with your fingers until the crust is formed the entire way around. Step 5) Once your crust is formed, you can start to warm up the dough and prep it for a proper stretch.As you rotate the dough with your dominant hand, give it a little stretch. 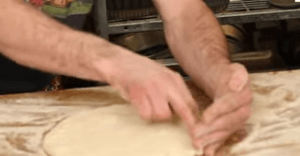 Your other hand should be holding down the dough to build symmetry and tension. Step 6) Lastly, before you get your baby up in the air, you’re going to really stretch it out. Hold the bottom of the dough with your knuckles, not your fingertips. Fingertips have a tendency to create holes. 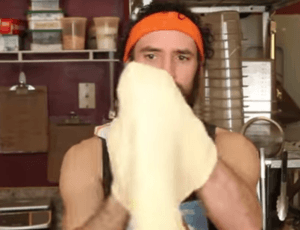 While holding it with your knuckles, you’ll want to use your thumbs as a guide and rotate the dough through them. Don’t overthink this one – just let the dough do the work! It will naturally stretch from the center due to centrifugal force. Beginners out there, remember: There is a top and bottom to the dough. Let’s keep it that way! Are you a visual person? 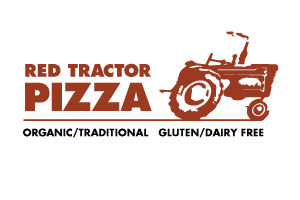 Then subscribe to our YouTube channel to stay up to date on all the latest videos from Red Tractor Pizza!